Hillary Clinton has outlined what she would do on immigration if she becomes president. She claims that she would like to extend President Obama’s deportation relief programs, also known as the ACA and DAPA, and close private immigrant detention centers and introduce immigration reform legislation with a path to full and equal citizenship. However, despite her positive-sounding campaign speeches on immigration, Clinton has a track record of making controversial statements about undocumented immigrants. For example, in 2003 in an interview on WABC Radio’s John Gambling show, Hillary Clinton said, and I quote, I am, you know, adamantly against illegal immigrants. Let’s have a listen. HILLARY CLINTON: We’ve got to do several things. And I am, you know, adamantly against illegal immigrants. I made this exception basically on humanitarian grounds because of the individual stories. But certainly we’ve got to do more at our borders. And people have to stop employing illegal immigrants. Come up to Westchester, go to Suffolk and Nassau Counties, stand in the street corners in Brooklyn or the Bronx, you’re going to see loads of people waiting to get picked up to go do yard work and construction work and domestic work. 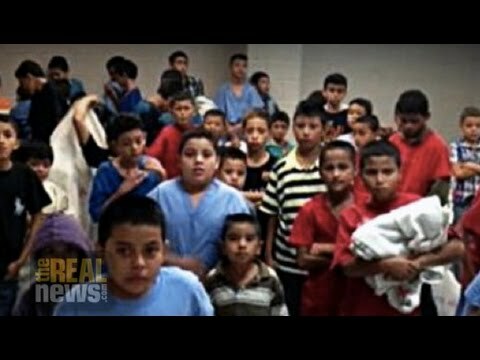 PERIES: And although this was many years ago, in 2014 Clinton also defended a position of deporting thousands of Central American children escaping to the United States. So what are her real policies when it comes to immigration? Joining us now to discuss all of this from Oakland, California, is David Bacon. David is an award-winning photojournalist, author, immigrant rights activist, who has spent over 20 years as a labor organizer. His most recent book is Right to Stay Home: How U.S. Policy Drives Mexican Migration. David, so good to have you with us again. DAVID BACON: It’s a pleasure to be with you. PERIES: So David, Hillary Clinton, at least over a period of time now in this campaign period, has come out, and she projects an image of pro-immigrant sentiments, and she has added prominent Dreamer activist[s] to her campaign staff. What do you make of her track record when it comes to immigration? BACON: Well, that statement from 2003 really sounds more like something you would hear from the Republican candidates these days. I think Hillary Clinton’s position on immigration has evolved from that statement in 2003. And what’s most interesting I think are the ways in which she has tried to differentiate herself from the Obama administration and what the Obama administration has done. So while, as you say, she supports DACA and DAPA, the deferred deportation programs that the Obama administration is now defending at the Supreme Court, she has taken positions which are quite different. She says that she would end the detention of families, and end family deportations and close private detention centers. Well, the Obama administration built two big privately-run detention centers in Texas, specifically to hold women and children fleeing from Central America in the wave of migration we’ve seen in the last two years. So saying that she would close them is, I think, well, something that an immigrant rights activist certainly agree, and think is a very positive statement. And it’s also something that’s quite different from what the Obama administration is doing. In fact, the Obama administration has just recently announced that they were going to begin deportations of some of those people who have applied for asylum and been denied, sending them back, essentially, to the conditions that they’ve been fleeing in Central America. And the other place where she’s been different, or tried to outline her differences, is by saying that undocumented people should qualify for healthcare under the Obama administration’s affordable healthcare legislation. You know, undocumented people were very specifically written out of that legislation. And so to say that they should be included is again, a positive step that would be greeted and is being greeted by immigrant rights activists, and in a place where on her administration, presumably, would do something different. What’s really, I think, more of a concern is what she doesn’t say than what she does say. She says, for instance, that she would support comprehensive immigration reform. Well, that could be very problematic, because the comprehensive immigration reform bills that were actually debated in Congress over the last several years have some very, very negative parts to them that in a sense she’s effectively speaking, endorsing. So one, on the one hand you have, even for those people who are applying for legal status, undocumented people in the United States who would be trying to get legal status under that legislation, that legislation would have people wait for as many as 15 years on, and most people probably wouldn’t qualify under a lot of the bills that were in Congress. At the same time, those bills beef up immigration enforcement in the workplace, the notorious employer sanctions which basically require employers to fire people if they don’t have legal status. More enforcement on the border. And I think what’s also a source of concern is the fact that this legislation would increase greatly the kind of guest worker programs that have been the sources of enormous abuse of undocumented people, and essentially–workers come to the United States as part of these programs, rather. And which are also, sort of treat migration to the United States as being a source of low-wage labor for employers. This is the part of these bills that employers love. In fact, this is why employers began writing these bills some years ago. So that is one area of concern, is her position on comprehensive immigration reform. But there are some other aspects of what she’s not saying that are of equal concern. For instance, Hillary Clinton is not willing to talk about the roots of migration. Why are people coming to the United States in such large numbers from Mexico, from Central America? Hillary Clinton was the Secretary of State, for instance, when the Honduran oligarchy overthrew President Manuel Zelaya for trying to implement which were really some pretty mild reforms to the Honduran economy, a minimum wage law, for instance. And then as Secretary of State, the Obama administration essentially kind of made a very weak criticism of the coup, and then within very short order then recognized the coup government that took power afterwards. Well, the, the lack of any kind of economic reforms that benefit workers in Honduras, together with the long history of the wars in Central America that produce refugees coming to the United States to begin with, U.S. deportation policy, which deported young people from the slums in [inaud.] in the United States back to Honduras and other Central American countries which then helped to create that climate of violence people are fleeing today, all of these are in some ways things that you can lay at the door of the Obama administration and U.S. administrations that have come before that. So instead of recognizing that, to simply treat people coming to the United States as though they were appearing from nowhere at our border is not realistic. You know, we need to talk about what it is that people are coming from. And another one is the trade treaties like the North American Free Trade Agreement. PERIES: David, what’s missing from Hillary Clinton’s immigration platform is really the discussion about trade deals and the impact these trade deals have on our border nations and Latin American countries in particular. And the, the inequities, the economic conditions and hardships that these agreements have forced on people living in these countries, that’s why they’re leaving. And I’m wondering, since you worked on Mexico in particular, give us a specific insight into how these agreements transpire in places like Mexico. BACON: Sure. And I would say this is a very, very relevant issue. One that Hillary Clinton is agonizing over, because of the fact that, that the Obama administration is pushing to get the TPP, the Trans-Pacific Partnership, another huge trade agreement, through Congress now. And she’s going to have to take a very definite position whether she favors it or is against it, as that travels through Congress at the same time as her campaign for the nomination unfolds. So taking a look at the trade agreement that in many ways the TPP is modeled on, North American Free Trade Agreement was negotiated under a Republican president, George Bush I. And then passed through Congress under a Democratic president, President Bill Clinton. Which basically makes you, or gives us the understanding that these are bipartisan agreements. This is not–these are not agreements where there’s a lot of disagreement between Republicans and Democrats. And that’s because both parties essentially are supporting these agreements in the interests of their campaign contributors, especially big business here in the United States. So looking at what the North American Free Trade Agreement actually did in terms of migration, just looking at the numbers to begin with, when the agreement passed and when it went into effect in 1993 and ’94, there were about 4.5 million Mexican migrants living in the United States. By 2010, that number had increased to about 12.5 million people. So in other words, 8 million people came to the United States during the period that the agreement was in effect. That’s no accident, because the agreement had a devastating impact on the lives of poor people, working people, and farmers in Mexico. The agreement was intended to benefit U.S. businesses, so a company like Walmart, for instance, became the largest retailer in Mexico at the same time as it’s the largest retailer here in the United States. Big U.S. corn companies [stopped] corn in Mexico driving farmers off their land in southern Mexico. Big meatpacking companies like Smithfield did the same thing with meat exports to Mexico. So all of these things basically displaced people in Mexico, whether they were farmers growing corn who couldn’t survive any longer, or whether they were workers in industries that got privatized, for instance for the benefit of foreign investors who came in and kind of gobbled them up. So those people had to do something for their families to survive, and essentially what people did was they came to the United States. Those people who could get visas did get visas. So about 5.5 million people did get some kind of visa to come to the United States. But there aren’t that many visas that allow people to come, and the economic pressure on people was so great that people really came anyway, which is one reason why we have the growth of the undocumented population in the United States reach about 11-12 million people, which is where it sits right now. People are coming essentially because of this kind of enormous economic pressure, along with the history of military interventions that we’ve talked about before. So this is what NAFTA really meant. And here we are now, negotiating a treaty that includes Mexico, includes Canada, who were the signatories to the NAFTA agreement, and also includes the number of countries surrounding the Pacific Rim who are already feeling the impact of the global economy. In other words, the displacement of people, kind of throwing people out into the world as migrant workers. So we can anticipate that a country like Vietnam, for instance, which last year sent about 100,000 people out into the world as contract laborers everywhere from Saudi Arabia to other countries in Latin America, are, are going to feel the impact of the TPP in the same way. So in other words, the number of people having to leave in order to survive is going to grow. So what sense, essentially, does it make, really, to talk about increasing enforcement of U.S. immigration laws and U.S. immigration policies, for instance on the border? All of the candidates running for president, whether it’s Bernie Sanders, Hillary Clinton, or the Republicans, say that they are in favor of more immigration enforcement. They disagree on how that enforcement should take place, but one place they think it should happen is on the U.S.-Mexico border. Well, if you put pressure on people to leave home, and to, you know, go off into the world and find employment so their families can survive, and then you say, well, let’s increase enforcement at the border, whether we do it with border walls, which is the Republican idea, or whether we do it with so-called smart enforcement, or more electronic enforcement, which is more the Democratic idea, enforcement, in the end, is enforcement. So here on the one hand you’re sort of pushing people out into the world, and then on the other hand you’re saying we’re going to turn you into criminals when you try and cross the border to come into the United States to find a job. That’s the problem. And none of the candidates really are speaking to that in a way that really talks about the kind of fundamental changes that have to take place in this global economic system in order to really deal with this problem at its roots. PERIES: All right, David. There is a lot more to discuss on this issue, and we look forward to having you back so you can spell out what a program like that can look like. BACON: I look forward to the opportunity.